Nov. 19, 2013, 12:16 p.m. So how much does an old online journalism domain name go for these days? For OJR.org, it appears the price was over $19,000. By Joshua Benton @jbenton Nov. 19, 2013, 12:16 p.m. In case you didn’t see my story posted late in the day yesterday, the Online Journalism Review — a 15-year-old chronicler of the evolution of digital journalism — has been turned into a spamblog. All the details are at the original article, but the basics are these: USC Annenberg, which ran OJR, forgot to renew their domain name. It was grabbed by someone named Marcus Lim, CEO of an Australian startup called Oneflare, who proceeded to turn it into a fake version of the Online Journalism Review — pretending to still be part of USC, stealing dozens or hundreds of copyrighted OJR articles, and generally being a jerk. Why? All to promote its products through better search engine optimization. In the hours since my story went up, there’ve been a few updates. USC Annenberg is taking steps to regain control of Online Journalism Review, after the domain of OJR.org was allowed to lapse earlier this month. We’re proud of the investment we’ve made into the news outlet over the years — and of all the work so many talented writers and editors have put into it — and hope to continue ownership of it in the future. — Oneflare, probably rightfully scared of the litigation it would otherwise be asking for, removed the legally dubious material from OJR.org. They removed the OJR archive stories and the USC logos and changed the site name from “Online Journalism Review” to “Online Journal Review,” whatever that means. So the site is now solely a spamblog, rather than a spamblog cloaked in an old journalism website. Progress, maybe? — We have some evidence for what price OJR.org went for. The domain was put up for auction at NameJet (“The Premier Aftermarket Domain Name Service”) after it was allowed to lapse. 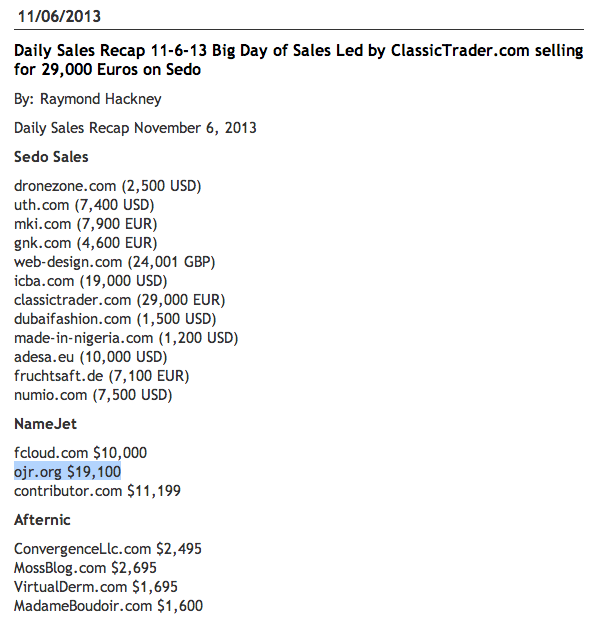 This roundup of domain sales from November 6 reveals the price it went for: $19,100. OJR.org had also been listed in October on a list of high-value expired domains — high value because it had been registered back in 1997, which gives it better Google juice. — Perhaps because it’s hard to step away from a $19,100 purchase, OJR.org continues to evolve as a spamblog. It’s actually a rare opportunity to watch a spamblog be built in real time — normally you only find them after they’ve been doing their dark magic for a while. That means the main work to be done now is Google’s. 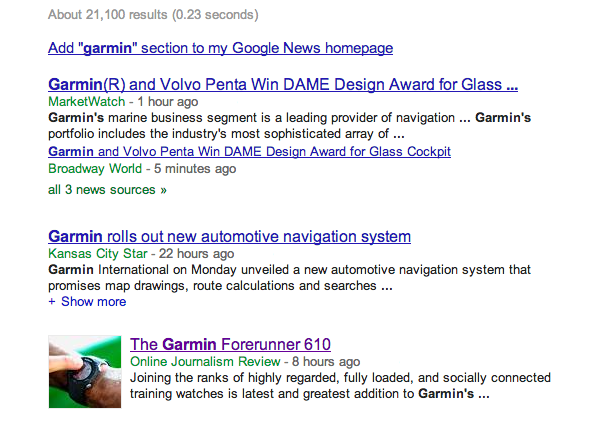 It needs to remove OJR from Google News, and it needs to eliminate the PageRank advantage that the old site built up for the new one. From there, it’s USC’s move on what to do with those remarkable disappeared archives. POSTED Nov. 19, 2013, 12:16 p.m.
Benton, Joshua. 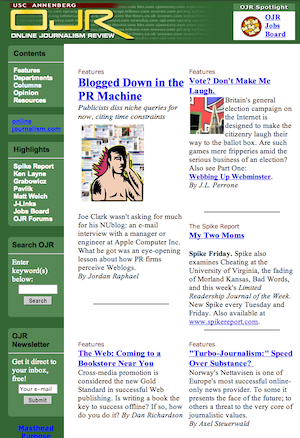 "OJR.org: An opportunity to watch a spamblog be built in real time." Nieman Journalism Lab. Nieman Foundation for Journalism at Harvard, 19 Nov. 2013. Web. 19 Apr. 2019. Benton, Joshua. "OJR.org: An opportunity to watch a spamblog be built in real time." Nieman Journalism Lab. Last modified November 19, 2013. Accessed April 19, 2019. https://www.niemanlab.org/2013/11/ojr-org-an-opportunity-to-watch-a-spamblog-be-built-in-real-time/.